At 6 feet 8 inches, pardon us for saying Tex Taylor throws a rather large shadow across the economic analyses landscapes in the Cowboy State and region. This year’s Andrew Vanvig Lifetime Distinguished Faculty Achievement Award has been a faculty member in the Department of Agricultural and Applied Economics since 1985. Taylor is the go-to guy for economic analyses of environmental, tourism and recreation, endangered species, and many other issues affecting Wyoming and Wyoming communities, notes Dale Menkhaus, Professor Emeritus in the department, who worked with Taylor for decades. “His achievements and contributions have gained for him a distinguished reputation, not only in Wyoming, but also in the western region and nationally,” says Menkhaus. Ditto, says Nicole Korfanta, director of the Ruckelshaus Institute in the Haub School of Environment and Natural Resources. Taylor has been a member of the Wyoming Open Spaces Initiative team for years, and his contributions have had substantial impact in Wyoming and beyond, she says. 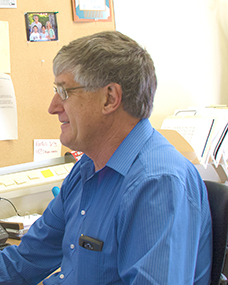 “Tex is a wonderful colleague – a gentle giant with a great sense of humor,” says Korfanta. About that giant reference – search the web for the Edgar, Montana, 1966 Class C championship basketball team, and a team photo will probably popup. Identifying Taylor, who was a 6-8 junior, isn’t hard. Perhaps one of the tallest high school basketball players in Montana was in Class C, the smallest competition classification. Edgar whipped those upstart Stanford Wolves from Helena 59-44, and finished that season with only one loss. Taylor and his two brothers grew up on a farm near Billings; he never considered staying on the farm. He would play basketball at Montana State University, and time came as a junior to pick a major. He earned his bachelor’s degree in 1972 and master’s in 1973 and entered a short stint in the world of banking in Omaha before returning west. Gene Lewis, a teammate from the Montana State basketball team, was working in a UW Extension program and called Taylor to ask if he was interested in working on a study in the Big Horn Basin that would last about six months. “I came down here and basically never left,” quips Taylor, who would earn his Ph.D. at Colorado State University in 1985. Chris Bastian, an associate professor in the department, says Taylor was always a patient, kind and generous mentor. Taylor helped Bastian with his dissertation. Taylor taught the details that need to be considered in pertinent analyses, information not found in textbooks or software manuals, says Bastian. “It is this kind of mentorship and expertise that sets Tex apart from many so-called experts,” he says. Applied research, studies that help understand a given issue or question, appeals to Taylor. Taylor spent three years in Teton County as an extension educator and says he came away having learned how to frame things in a clearer, more easily understood and helpful way. He also came away with a wife. He met Rebecca in Jackson. They have two children, who both live in Laramie. Korfanta says Taylor led documenting the growth and redistribution of Wyoming’s population and how that affects the loss of open spaces Wyoming residents value. “I know his work has also provided a template for others around the West to understand the economics of open spaces,” she says. Taylor is a long-time member of the Consensus Revenue Estimating Group, which tries to estimate near-future revenues received by Wyoming’s government. It’s a cocktail of annual estimates in October to assist in the governor’s preliminary budget, with a revision in January. Mineral prices, natural gas prices, the stock market all come into play. “It’s a very difficult thing to predict,” Taylor says. Still, he likes looking at the economics of specific topics with broad influences. Those include public lands and open space issues, a recent economic impact to Wyoming’s economy from a potential listing of the sage grouse, and examining the H-2A agricultural guestworker program and the sheep industry. The program allows agricultural employers to hire foreign nationals to fill temporary jobs. The reports have caused a greater understanding of complex interactions. “The economist does the analysis and that’s wonderful and great, but to be useful, and where I get satisfaction, is when people actually use it,” says Taylor.